Our greatest literary heroes culminate in a shared belief that fictional characters, with the capability to overcome loss and misfortune, are like us. Atticus Finch, Holden Caufield and Lily Bart carry an appearance of normalcy, but dive to that deep, dark, unreachable and unexpected place, sourcing it for strength, emerging with wisdom and transcendence. Adversity, how we find meaning in it, is a primal human journey from Plato's cave to modern warfare. Colby Marshall knows this. As writers write to discern personal suffering, Marshall is no exception. Marshall grew up comfortably, a model student with a childhood cloaked in tutus, dance lessons and a glaringly suburban lifestyle. Nothing seemed "off" to Marshall, as she excelled in academics and dance, and played with her pet cats. As an adult, Marshall remains sparkly, light and smart as hell. She is funny, humble, gracious. Marshall's life, past and present, is not definable by what she missed out on. Quite the opposite, Marshall never paused her active, engaging aspirations to consider that her likely heritable attribution of sense to color was not "normal." For Marshall, color has a magic in it, pervading her, seeping into her senses without need to tone down. It just is. Like shamans seeing auras and penetrating outlines of spiritual seekers, Marshall's sense responses are involuntary and automatic; although, to be clear, Marshall's condition is not one in which she sees auras. In college, Marshall was diagnosed with synesthesia, a spectrum sensory disorder that imbues color with more than simple meaning. In neuro-typical brains, messages get delivered for informational purposes, usually without fixation, unless the brain detects probable cause of danger. Marshall grew up, got married, had children -- Olivia, and another, Isaac -- both to whom Double Vision is dedicated. Marshall, surfer of prismatic rainbows, where color heightens, saturates her senses, determines for her how to perceive and experience everything, is comfortable with her kind of "normal." 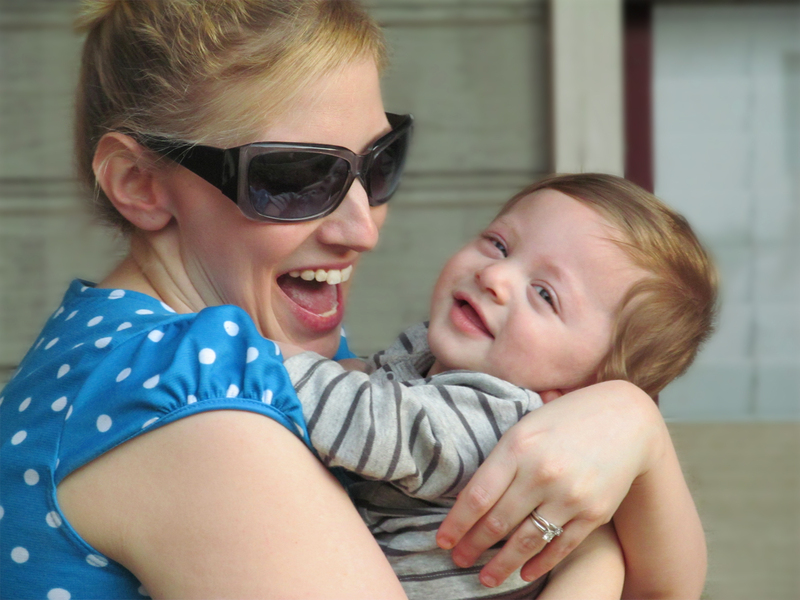 Upon Isaac's birth, Marshall and her husband learned that Isaac had a grade-4 brain bleed in utero. Marshall's life, experienced through deep layers, panels, fibers of color, where a rose isn't just red but has sound to it, was unhinged when Isaac landed opposite her on the spectrum. Where she skipped down yellow bricks, found friends, ate apples and napped amongst poppies, clicking her ruby slippers three times did not guarantee her seamless re-entry back home. Isaac would not see the Emerald City like his mother, but remain a villager of Kansas, where Toto runs the streets chasing Miss Gulch in black and white. From color overload to absence of rainbow, mother and child are confounded, at opposite ends of a tightrope, in perpetual motion to meet in the middle and decode what the other literally cannot see. Although Isaac is not colorblind, his diagnosis is potentially indicative of possible blindness. In Double Vision, Marshall writes with sensitivity and curiosity, entertaining, not only teaching, with her words. 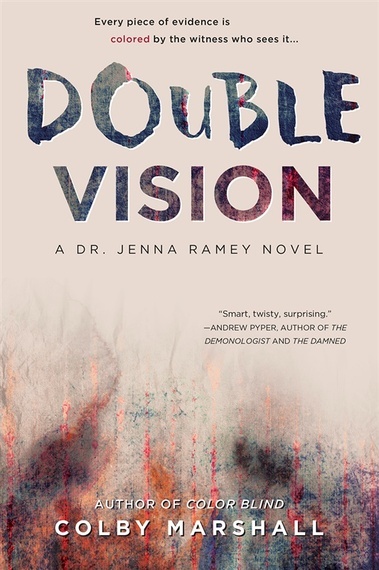 Dr. Jenna Ramey, an FBI forensic psychiatrist diagnosed with synesthesia, is drawn out in suspenseful time signatures. Readers are exposed to her foundational struggle. The dilemma between her personal life, automatic, involuntary, flooded with sense, is filtered through her professional life as a scientist, psychiatrist and forensic expert. Jenna sees what her colleagues cannot, but crimes are punishable by evidence, hard science, visible facts. After a mass murder, Jenna is forced to navigate, differentiate between two worlds, "having a feeling" an unacceptable stone to cast at human lives. Jenna must learn to communicate with bright and happy child, Molly, normal in appearance, but intensely fascinated and distracted by numbers. Jenna must self-regulate, temper her own language, completely foreign to Molly. Molly's numerical giftedness is spoken in pattern recognition, but Jenna is losing precious time (and maybe lives) decoding Molly's complex language. There is particular layering to Double Vision, as Jenna inevitably projects herself onto Molly, whose sweet, empathic soul and eagerness to please resonate with Jenna. As a child, Jenna prevented her own death at the hand of her mother by using her "gift" for involuntarily assigning color associations to everything she encountered. As Marshall can tell you, the idea that psychiatric illnesses present themselves in clean textbook pages is atypical, as television crimes are not solved in 40 minutes, plus advertisements. Jenna's training collides with her experience, internal, authentic only to her. Can Jenna prevent future destruction as an adult in the way that she successfully accomplished this as a child? How will she separate her past from her immediate need to understand and work with Molly? Marshall writes for a science-conscious consumer while simultaneously capturing mysteries we are yet unable to measure and fully see. Marshall does not insult readers by dumbing down. Jenna is a robust character, as is Molly, with relatable vulnerability. Capturing readers in the crosshairs of cultural obsession for forensic media and amateur sleuthing, Marshall taps into a new generation of fans, edgier, a bit more skeptical and a tad wiser than first-generation forensic fans of the past two decades. Marshall's ability to span generations is the appeal to hook readers into Jenna Ramey's universe. Blind or not, we thirst to understand suffering. Marshall serves up common conundrums, balancing two swirling, elusive worlds, equal, opposite, science, the mystical, in one smartly written package. "See" for yourself, the known and unknown, both perspectives, in Double Vision.